A skeptic in a world without skepticism. 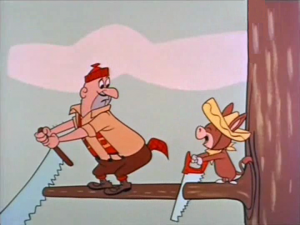 The knight, Antonius Block, returns home from the Crusades, with his squire Jöns, without a prayer: literally without a prayer. Block cannot find it in himself to pray. He has traveled across the world and killed hundreds of men in the name of an amorphous being that he cannot hear, touch, or smell. He does not know its wishes or demands. He returns home disilusioned and wanting evidence of God. Does God have a plan, and what is its plan for this wandering Knight? Does God even exist? 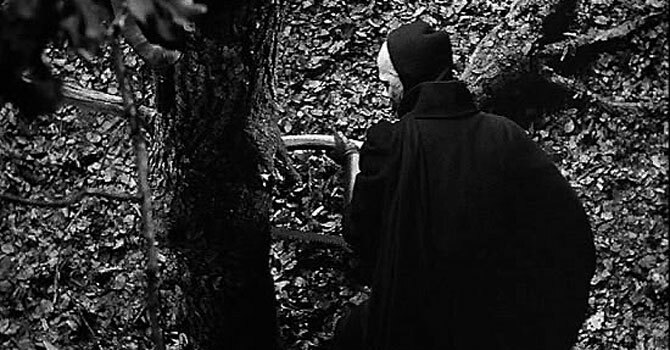 Ingmar Bergman’s The Seventh Seal is more than a meditation of the inexplicability of life. Above all else it is an entertaining film. Like Tolstoy, Bergman is an entertainer who is not above posing deep philosophical questions while giving the audience room to laugh at the black comedy peppered throughout the film, or cringe at the parade of sufferers of the Black Plague. 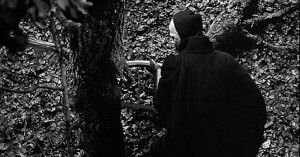 The Seventh Seal is an accessible film for all who are not turned off by the film erroneous reputation as a doom and gloom downer. The problem with a masterpiece of art, it that there is so much to write and not enough space to write it. Essays, college theses, and books have been written about this particular film, but this article is an overture to the film and its importance in cinema and culture. The Seventh Seal is lyrical in its images and in its words. Both are beautiful and meaningful and that is the highest praise any film can receive. 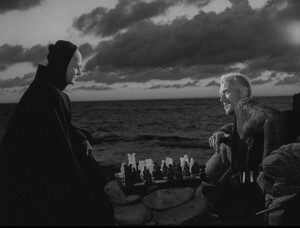 The image of Death draped in black greeting Antonius Block on the rocky seashore as the sound of the waves fade away as the cloaked figure addresses the crusader, “Jag är döden (I am Death).” In a cunning plan to cheat Death, Antonius Block sits down to play Death’s favorite game: chess. As we later find out it’s hard to cheat a cheater. As the two sit down for their game we are given one of the most immortal (pun not intended) images in cinematic history. Influenced by medieval church paintings the image has been reproduced on film magazines, philosophical books, as well as being spoofed in numerous films and T.V. shows. Bergman also gives us images of serenity and beauty. Antonius Block and his squire enjoying life with milk and wild strawberries in the company of a troupe of actors made up of a happy mother, father and a baby boy. These idyllic scenes are ephemeral punctuated with scenes of violence, death, and Death. Bergman makes us nostalgic for the present given the knowledge that the serenity will not last. Bergman’s script is poignant, meditative, and comical. He has the ability to condense complex ideas into poetic beauty that are just as powerful as the imagery on screen. Jöns: Love is the blackest of all plagues…if one could die of it, there would be some pleasure in love, but you don’t die of it. Antonius Block: This is my hand. I can turn it. The blood is still running in it. The sun is still in the sky and the wind is blowing it. And I…I Antonius Block, play chess with Death. Bergman was smart in choosing the actors in which to deliver his words. Max Von Sydow in his defining role as the stoic yet disillusioned knight. Sydow and Bergman collaborated on several other projects together before Sydow was scooped up by Hollywood. Bibi Andersson Bergman’s longtime muse is Mia and Gunner Bjönstrand as the cynical squire, Jöns. Recognizable faces in Bergman’s oeuvre. Antonius Block: You drew black. Death: Appropriate don’t you think? 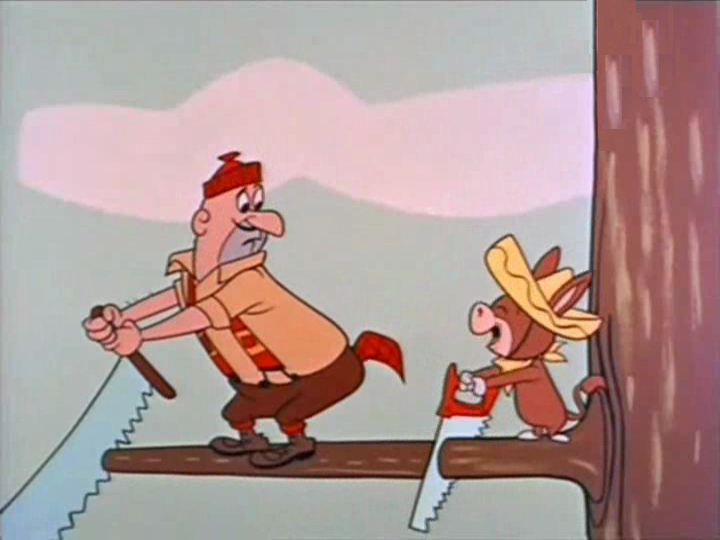 cutting at the trunk of a tree while one of his victims watches clinging to a branch and pleading, “Is there no exemption for actors?” In other hands the contrast between somber reflection and broad comedy would create whiplash, but Berman weaves the two deftly creating a free flowing experience for the audience between humor and tragedy. Antonius Block is skeptical of God’s existence and only requires a modicum of evidence to regain confidence in his creator. All around him he sees monks drowning the victims of bubonic plague in guilt and parading them through villages they whip themselves for their transgressions. Some religious leaders have turned their back on God and become thieves and rapists. Why are the undaunted followers of God so cruel? Does this mean God is cruel, if he exists? Bergman sends us down a rabbit hole of philoso phical and religious questions. He never gives us an answer, but a dialogue. The Seventh Seal is more than a cinematic masterpiece, it is high water mark in humankind’s artistic endeavor to tackle the enduring questions of our humanity. It’s influence rippled through cinema and culture from Woody Allen to the Bill and Ted films. Bergman created a film that confronted the big questions head on for the first time in cinema. The film was an international success and Bergman continued a prolific career till the time he met death in 2007. Despite The Seventh Seal’s reputation as an unforgiving depressing slog, it is a film that is filled with moments of comedy, tragedy, horror, and sublime introspection; like life itself. Previous ArticleTV Review: Jane the Virgin Winter Finale - "Chapter Thirty"